I ran into this spider today; literally. Not the very same spider. I last saw that one scurrying away on the ground after dropping from the front of my shirt accompanied by some high-pitched sounds I didn't know I could make. No doubt the mad spider would have also made noises - if it could - after I blundered through its beautifully constructed orb web. The spider (Argiope aurantia) goes by several common names including the black-and-yellow garden spider; black-and-yellow argiope; yellow garden argiope; yellow garden orb-weaver; golden garden spider; writing spider; zig-zag spider; and corn spider. Anyone who walks through their webs may create new common names such as the EEEiiiiWWWAAA #&%@! spider. It is one of the largest and most spectacularly colored orbweavers found in Ohio. The literature notes females can measure over 2" in length from the tips of their legs; but the one on my shirt looked about 1' long. Females love to suspend their webs between plant stalks including cornstalks; thus the "corn spider" common name. The "zig-zag spider" and "writing spider" common names comes from the vertical structure of dense, course silk, called a "stabilimentum," near the center of their orb webs. The abdomen of most members of the species is covered in an intricate pattern of inky black and yellow markings which are responsible for the spider's "black-and-yellow" common names. However, a small percentage has dark brown rather than black markings. As with all orbweavers, webs produced by this spider are intricate structures involving both sticky and non-sticky silk. Non-sticky silk is used for "radial threads" which radiate from a central point like spokes on a bicycle wheel. The non-sticky silk is also used for "frame threads" which encircle the web like a bicycle wheel to hold the radial threads in place and to attach the web to supports such as plant stems. "Spiral threads" are composed of sticky silk arranged in a spiral pattern emanating from the center of the web; it's the sticky silk that captures the spider's prey. 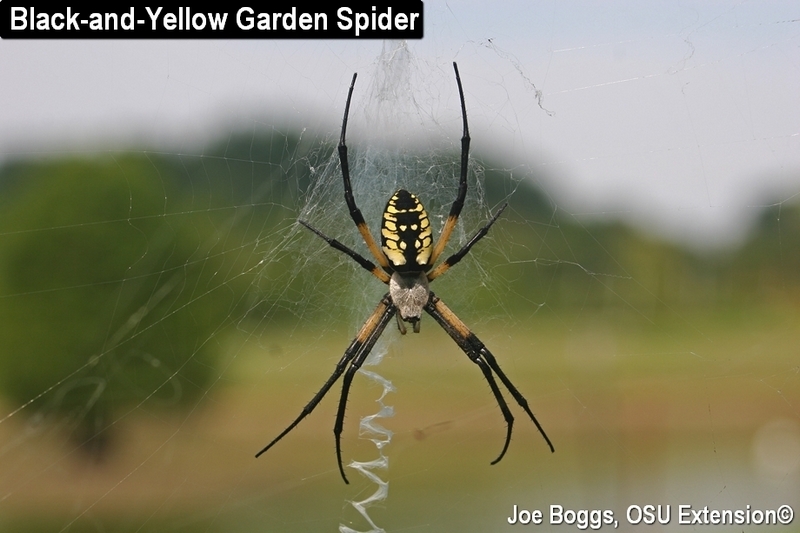 Black-and-yellow garden spiders presented entomologists with two puzzles. First, what is the exact function of the stabilimentum? Second, how can such a large, brightly colored spider hanging in the center of its web in the middle of the day be so successful in snaring insects (and entomologists!) with their web? It would be like sheep running to wolves. The answer to both questions requires an understanding of insect vision. Many insects are capable of seeing light in ultraviolet wavelengths that are invisible to our eyes, and certain flowers that appear white to our eyes actually reflect intricate patterns of ultraviolet light, presumably to attract insects. Research has shown that when some Argiope spiders and their webs are viewed under ultraviolet light; the spider disappears, the web disappears, but the zigzag stabilimentum blazes like a giant neon "eat here" sign. Insects may be lured to their doom thinking they are visiting the mother of all flowers! Once an insect victim is ensnared, the spider rushes over and jabs its fangs (chelicerae) through the exoskeleton to deliver a venomous brew containing both neurotoxins to halt the insect's struggling and necrotoxins which are digestive enzymes that dissolve the insect's innards. Black-and-yellow garden spiders then quickly wrap their food prize in silk drawn through spinnerets located on the underside of their abdomen. The spinnerets allow the spider to change the density and "thread count" of the silk. The following series of images shows how the process works; note the changes to the silk. The last image shows the spider hanging its meal in the center of its web. It will enjoy an insect Slurpee after the necrotoxins have done their work.